Embrace Building Wraps have just delivered one of our most operationally challenging and creative projects to date. 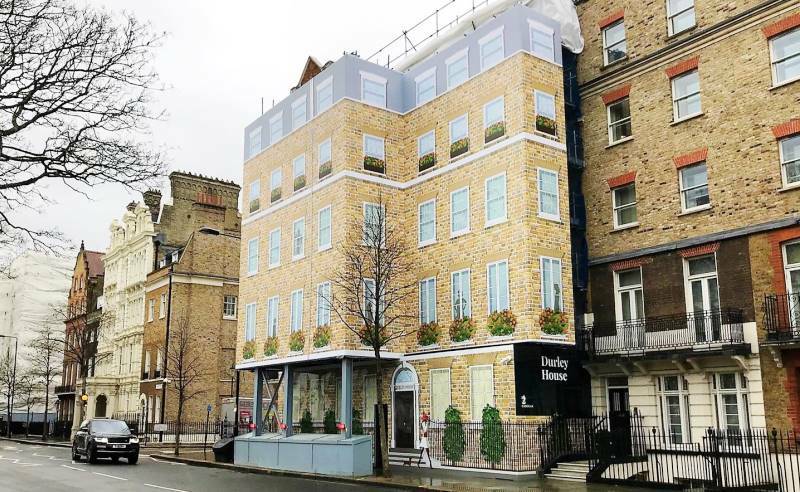 The installation is now complete at Durley House, located on Sloane Street in Chelsea, London. Embrace were contracted to deliver the project for Cadogan Estates working closely with McLaren Construction – the main contractor on site. 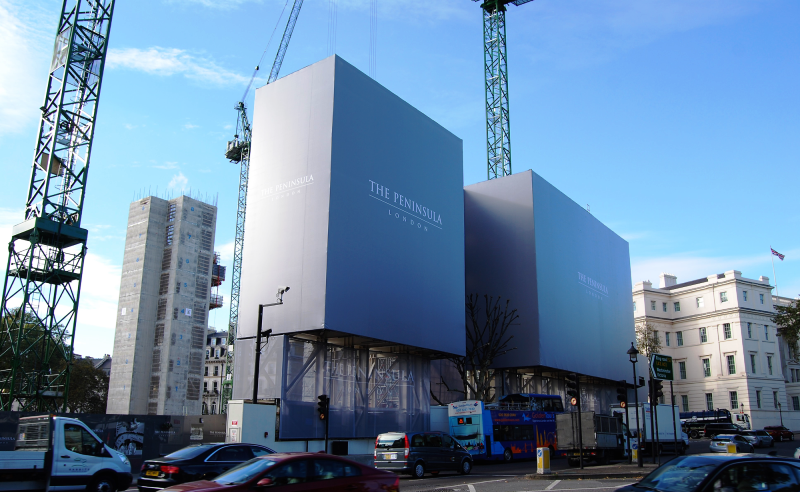 A temporary three tier heavy steel structure comprising of site offices and welfare cabins had been constructed directly adjacent to Durley House, an exclusive property comprising of a restaurant, bar and fourteen suites. 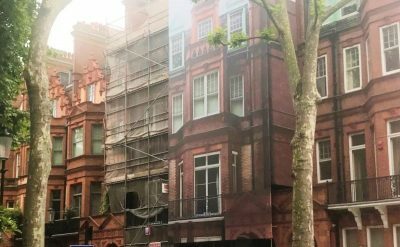 Given the Sloane Street address – a destination for the wealthy and fashionable since the 18th century – it was clear that any disruption should be encapsulated and disguised whilst the works are completed. The Embrace solution comprised of two main elements – a solid PVC wrap with five distinct elevations which would then meet with printed site hoarding on ply beneath. 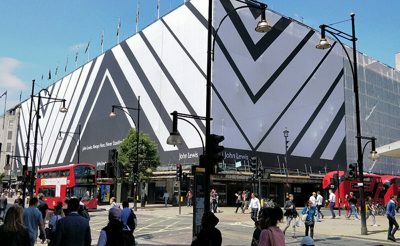 The graphics on the site hoarding would also need to seamlessly connect with three of the PVC wrap sections directly above. The five elevations of the steel structure were wrapped in a meticulously planned single sheet banner placed over a fully engineered offset banner frame. On street level the striking ply hoarding precisely adjoins to the banner above leaving just a 50 mm void between the two sections. “This was one of our most creative challenges to date.  With our experienced teams in place we were able to deliver pinpoint precision on our templates by creatively use a smaller desktop scale simulation. Dimensions were accurate down to the very last millimetre which we were then able to scale up fully for operational use on site.